What are the treatment Options for Trigeminal Neuralgia facial pain? From drugs, to surgery, to upper cervical chiropractic procedures, we cover some of the primary options that facial pain patients have in health care. What is Trigeminal Neurgalgia and what causes it? Trigeminal Neuralgia (TN) causes severe facial pain. There is no gold-standard medical device or pathological test that’s conclusive for the condition. That means the diagnosis is clinical based on symptoms. There is no known universal cause for TN pain that’s recognized by medial authorities. What are the goals of treating TN pain? The main goal of treating TN is to relieve the patient of pain. Upper cervical chiropractic care is another option for TN pain patients, and is best understood as a way to correct an underlying biomechanical irritation of the TN nerve, rather than as a medical pain management. My hope is that medical professionals educate their patients on all aspects of management and on what to expect from different treatment options, including the upper cervical chiropractic procedures. What are the medical treatments for Trigeminal Neuralgia Facial Pain? Image from surgery reports to show Trigeminal nerve compressed by blood vessel. What oral drug therapy is available for Trigeminal Neuralgia facial pain? Carbamazepine and oxcarbazepine are the first-line of drug treatments for Trigeminal Neuralgia. If either of these two drug therapies don’t work, then doctors may prescribed from the anti-seizure family of drugs. What are the surgical options for TN? Surgical procedures are reserved for patients with severe, debilitating pain that does not respond to least three medications, including carbamazepine. Gamma Knife Radiosurgery – the only non-invasive surgical treatment for TN performed in the outpatient center. It involves targeting the trigeminal root in the posterior fossa with a focused beam of radiation. Microvascular decompression – while it is known to provide the most sustained pain relief, it is a major surgical procedure that requires craniotomy (removing a part of the skull to expose the brain). Glycerol injection – a thin needle is injected into the cheek through the opening in the base of skull. Anyone considering these surgeries should be able to reach out to other patients who have opted for these procedures via online support groups, and the like. One resource to contact is the support network of the Facial Pain Association. Any surgery will have a potential for either side effects or injury during the surgery itself, so patients need to take these risks into account. Upper cervical chiropractic care for Trigeminal Neuralgia pain? Some patient decide to use chiropractic techniques combined with drug treatment to manage their TN attacks. Often times patients are already on pain medications when they arrive at upper cervical chiropractic office, and the upper cervical correction allows them to taper off the meds under the help of their physician. Some patients prefer simply managing their pain with upper cervical chiropractic care because it’s non-invasive and provides significant pain reduction in many cases. It is highly important that TN patients know that general chiropractic procedures may provide some TN relief, however, the experience of many TN patients points to the effectiveness of working with a chiropractor who uses upper cervical chiropractic procedures. Is there a connection between upper neck and head trauma and Trigeminal Neuralgia? Damage to the upper cervical ligaments and other soft tissue may be visible with specialized MRI which includes specialized CCJ views, whereas the CBCT and x-ray document misalignment. Does upper neck imaging show compression of the Trigeminal Nerve and that’s why upper cervical chiropractic care helps? Diagram of upper cervical spine through middle of the body. No. Imaging that shows injury or misalignment in the upper neck will not show compression of the TN nerve, which is up in the mid brain steam. Instead its understood to reveal an underlying cause of TN pain, resulting in congestion or irritation of the trigeminal nucleus which has extensions down into the spinal cord. Direct compression on the TN nerve is hard to document in TN. 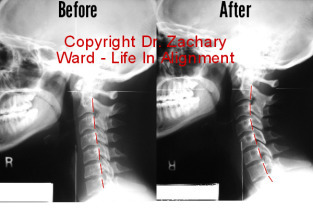 Patients should know that if imaging does not include an upper cervical chiropractic perspective, then patients who undergo these studies will receive reports that don’t comment on upper cervical alignment, and they may never learn of the connection between the upper neck and TN pain. Would you like a second opinion on your facial pain diagnosis, or would you like to be screened for a structural problem in your neck that may be contributing to your facial pain symptoms? Please use the contact form below. 1. Trigeminal Neuralgia Fact Sheet | National Institute of Neurological Disorders and Stroke. https://www.ninds.nih.gov/Disorders/Patient-Caregiver-Education/Fact-Sheets/Trigeminal-Neuralgia-Fact-Sheet. 2. Obermann M. Treatment options in trigeminal neuralgia. Ther Adv Neurol Disord. 2010;3(2):107-15. 3. Beydoun A. Safety and efficacy of oxcarbazepine: results of randomized, double-blind trials. Pharmacotherapy. 2000;20(8 Pt 2):152S-158S. 5. Rodine RJ, Aker P. Trigeminal neuralgia and chiropractic care: a case report. J Can Chiropr Assoc. 2010;54(3):177-86. 6. Zielinski E, Acanfora M. Resolution of Trigeminal Neuralgia Following Subluxation Based Chiropractic Care: A Case Study & Review of Literature. Annals of Vertebral Subluxation Research. 2013:33-34. 7. Kessinger R, Matthews A. Resolution of Trigeminal Neuralgia in a 14 Year Old Following Upper Cervical Chiropractic Care to Reduce Vertebral Subluxation: A Case Study. J Upper Cervical Chiropr Res. 2012:77-84. Excruciating facial pain not responding to medication?